If you are looking for comedy entertainment at its best, The Lyric at Gold Reef City is the place to be on Friday, 6 May and Saturday, 7 May 2016. Let The National Comic’s Party amuse you with a politically “incorrect” comedy special that will have you laughing all the way to the ballot box. 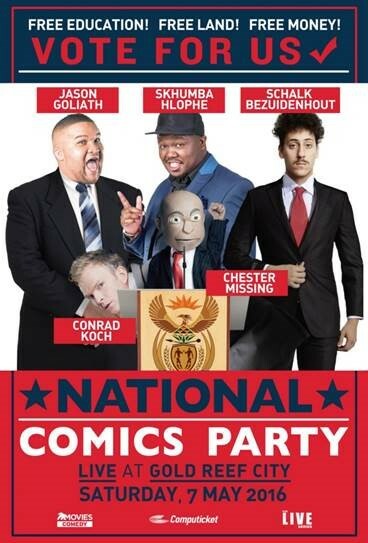 Four of South Africa’s best comics star in this election-themed special, Jason Goliath, Conrad Koch (Chester Missing), Schalk Bezuidenhout and Skhumba Hlophe, who are gearing up to launch their campaign of political hilarity and take on the mirth-inducing absurdities of the country’s current political landscape. Jason Goliath is a South African actor and comedian with a commanding stage presence, ridiculous amounts of energy and a character-based set focused on making audiences laugh at life’s uncomfortable truths. Conrad Koch is one of South Africa’s most in demand comedy talents and the winner of the 2010 entertainer of the Year award. He combines hilarious comedy with world-class puppetry, and has done so for over fifteen years to local and international acclaim. Schalk Bezuidenhout is one of South Africa’s premiere up-and-coming comedians. Born in Gauteng, raised Afrikaans, and having studied in Cape Town, Schalk quickly realized there was more to life than boerewors and rugby. Now he shares his unique views on contemporary South Africa with audiences all over the country. Skhumba Hlophe is a South African comedian, just a simple guy from Tembisa — born, bred and buttered! He is also known for his work as a radio presenter, and as an actor in his role of Dlamini in the feature film Taxi Ride, and its subsequent spin-off series of the same name. The National Comic’s Party needs your vote - This stand-up comedy special definitely won’t leave you wanting to pay back the money! Tickets are available at Computicket with prices ranging from R130 - R180. Visit www.goldreefcity.co.za for more information on upcoming Gold Reef City events and promotions.